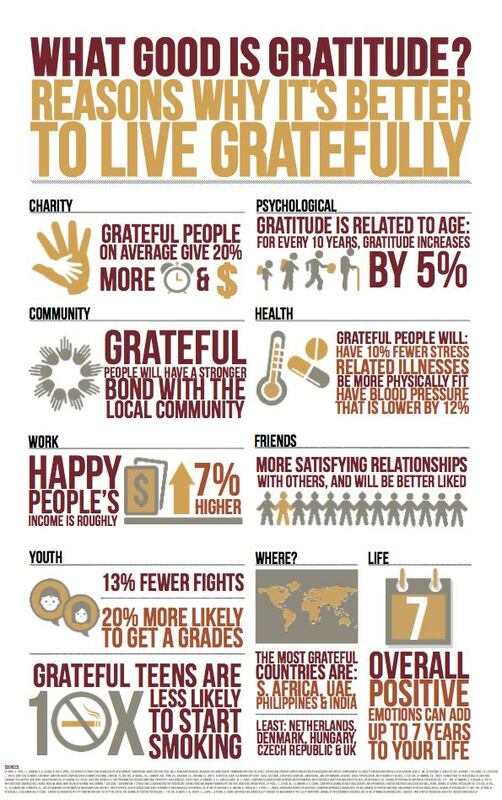 Gratefulness is about being appreciative of the benefits that you have received that allows us to afford with pleasantness and/or contentment. Of course, many of us will say that we worked hard, toiled and troubled for our achievements. It was because of our perseverance, desire and drive that we are triumphant and prosperous. However, in our egoistic views, we forget the sacrifices that many have made for us along the way. We disregard the gifts that many have given us without any expectations. Of course, people who are in our close circles have provided all the right opportunities and have always guided and supported us. In addition, there are other people who we might not even acknowledge or who even hurt us at one point or another. Nevertheless, they have taught us many valuable lessons and have helped us understand our strengths, so we should be grateful for those experiences as well. Moving on further, we should be grateful to our environment that has provided us with the air we breathe, nature we enjoy, water that we drink, the heat and cold we feel, the food that we eat, the birds that sing and chirp, the trees that clean our air and the soil that grows everything beautiful. The beauty of finding gratitude in our environment is that we will realize that everything provided to us is without any expectations of anything in return. Does the tree ask you for payment with taxes for performing photosynthesis? Think about if the earth were to ask us to return all of the ores and crude oil that we have removed. As humans, we plunder but nature still gives. Let’s go even deeper, when was the last time you counted your breaths to make sure you took a breath enough times? Did you ensure that your food was properly digested and that the nutrients went to all the right places in your body? What about making sure that your heart beats the proper number of times every minute? So, our body, our senses, our mind, our intellect, our concentration and our spirit are working for us and sustaining us. But when was the last time you said thank you? Do it right now and you will feel the joy and abundance embrace and uplift you. The gratitude that you are alive to enjoy your life is a gift. It is not meant to be taken lightly. The more you practice gratitude for every step that you take in life, all your woes and sorrows will feel manageable and in time insignificant. In general, you will feel more positive and optimistic about life. The Buddha also elaborates, “You have no cause for anything but joy and gratitude.” Practicing thankfulness is not that hard, all you have to say or think is that I am glad to be alive. It is that simple. Everyday you can also count five things that you are grateful for to keep your mind in the present. Many people write gratitude journals and thank you notes as an appreciation task. Those little and big things are all helpful in practicing gratefulness. For the month of April, there is the observance of World Health Day on Tuesday, April 7. This year the focus is on “How Safe is Your Food? From Farm to Plate, Make Food Safe.” So let’s practice gratitude towards the plants, animals, workers and along with the chef(s) (mostly parents and spouses) who have been instrumental in bringing delicious and nutritious food to our plates!